The First World War is often cited as being ‘the first modern war’, a description which refers to its scale, but also to the weapons used (Strachan 2004: xiv; Gilbert 1983: 423). 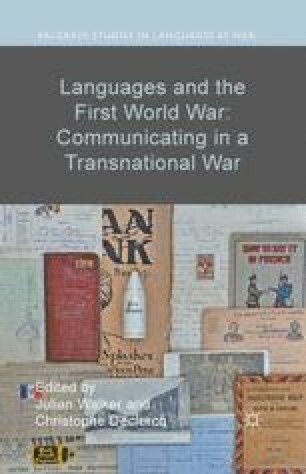 With over thirty-two countries involved, the war was inherently multilingual, which meant that interpreters and other language coordination services were essential. Armed conflict requires interpreters for intelligence services, for the coordination of troops if the soldiers do not all speak the same language, for communicating with civilians in occupied or besieged territories and for negotiating the end of the war (Baigorri-Jalón 2010: 180). Chielens, Piet, Dendooven, Dominiek, and Vanhaelemeersch, Philip (n.d.) ‘Interpreters and Coolies’, http://virtualexhibition.1418remembered.co.uk/zoom-on/in-the-footsteps-of-a-chinese-worker/%E2%80%8Binterpreters-and-coolies.html [accessed 14 August 2014]. De Roock, Marcel (n.d.) ‘Historiek van Mater Dei’, http://www.materdei-wzc.be/paginas/historiek/default.html [accessed 12 August 2014]. ‘The Task of Remaking Belgium: Dr. Charles Sarolea, Distinguished Belgian, Declares Plans for Reconstructing his Country must be Thought Out Now’ (1915) New York Times, 4 April 1915, http://query.nytimes.com/mem/archive-free/pdf?res=9C04E3DB123FE233A25757C0A9629C946496D6CF [accessed 24 April 2014]. Ursuline Sisters of Tildonk (2012) ‘Our Congregation’, http://www.osutildonk.com/about_us/history/congregation/gregation.html [accessed 12 August 2014]. Vlotides, Maria (n.d.) ‘The Language of Diplomacy’, http://www.diplomatmagazine.com/index. php?option=com_content&view=article&id=174&Itemid [accessed 24 April 2014].